Powered Two-Wheeler Safety: "The results of research must be brought back into the real world"
Session 2: ACCESSING MOTORCYCLING - Safer and better access to Powered Two Wheelers? SAFER Motorcycling in Europe NOW! How can we tackle motorcycle safety challenges for the next decade? RIDERSCAN project, A European Scanning Tour for Motorcycle Safety, is aiming at taking a magnifying glass and look at country’s expertise on Knowledge of motorcycling safety, Access to powered two wheelers, Traffic and Road Environment, efficient Safety Campaigns and PTW-safety Strategies, to make recommendations for the EU intervention. The project is organizing its last public event to present and discuss the results of the RIDERSCAN data collection process with motorcycling and road safety experts. The event will consist of a full day Workshop at the CEN-CENELEC premises, followed by a half-day Debate Session in the EUROPEAN PARLIAMENT. 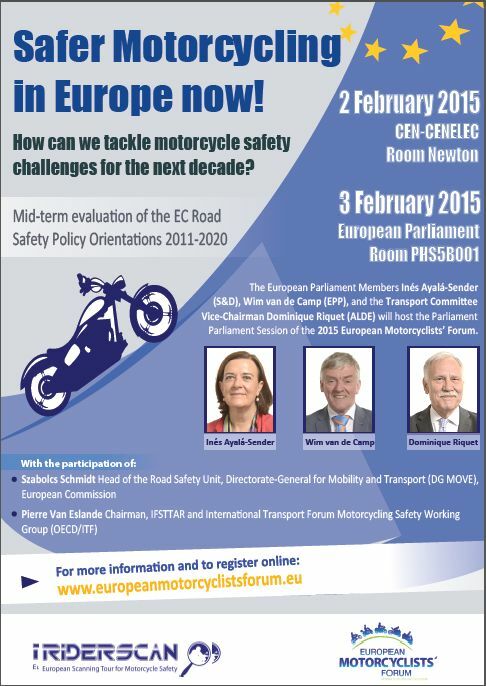 The 2015 European Motorcyclists’ Forum, kindly hosted by the MEPs Inés Ayalá-Sender (S&D), Wim van de Camp (EPP), and the Transport Committee Vice-Chairman Dominique Riquet (ALDE) will count on the participation of Mr. Szabolcz Schmidt (Head of the EU Road Safety Unit) to discuss the RIDERSCAN project outcomes in the context of the Commission mid-term evaluation of road safety policy orientations for 2011-2020. Safer Motorcycling in Europe now! 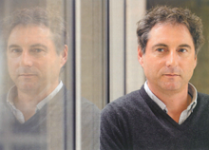 - How can we tackle motorcycle safety challenges for the next decade? Safer Motorcycling in Europe now! How can we tackle motorcycle safety challenges for the next decade? The EU co-financed RIDERSCAN project, A European Scanning Tour for Motorcycle Safety, is aiming at taking a magnifying glass and look at country’s expertise on Knowledge of motorcycling safety, Access to powered two wheelers, Traffic and Road Environment, efficient Safety Campaigns and PTW-safety Strategies, to make recommendations for the EU intervention. The project is organizing its last public event to present and discuss the results of the RIDERSCAN data collection process with motorcycling and road safety experts. The event will consist of a full day Workshop at the CEN-CENELEC premises, followed by a half-day Debate Session in the EUROPEAN PARLIAMENT. The 2015 European Motorcyclists’ Forum, kindly hosted by the MEPs Inés Ayalá-Sender (S&D), Wim van de Camp (EPP), and the Transport Committee Vice-Chairman Dominique Riquet (ALDE) will count on the participation of Mr. Szabolcz Schmidt (Head of the EU Road Safety Unit) to discuss the RIDERSCAN project outcomes in the context of the Commission mid-term evaluation of road safety policy orientations for 2011-2020. EMF Agenda: the Forum’s draft agenda can be downloaded here. Note that we are pending confirmation of additional speakers. For more information and to follow the preparation of the event, please access our website or our Twitter page (#RiderscanEMF). Closing date for registration is 19 January 2015. Seats are limited to 90 participants due to the CEN-CENELEC room capacity so make sure to registerwhile seats are still available! SAVE THE DATE 2-3 February 2015 - CEN-CENELEC Management Centre and European Parliament, Brussels. The Forum is hosted by the Transport Committee Vice-Chairman, Dominique Riquet (ALDE) and the European Parliament Members Inés Ayalá-Sender (S&D) and Wim van de Camp (EPP). This year’s forum will comprise of a full day workshop on the CEN-CENELEC premises, followed by a Debate Session in the European Parliament. The full-day workshop on Monday 2nd of February will present and cover the outcomes of the EU co-financed project A European Scanning Tour for Motorcycle Safety, including the state of the art of motorcycle safety knowledge, access to powered two wheelers, traffic and road environment, and the means to convey safety messages to the riding community, in order to set up a result-based PTW safety strategy. The Debate-Session in the Parliament will take place in the morning of Tuesday 3rd of February and will further expand on motorcycling safety in the context of the mid-term evaluation of Commission road safety policy orientations 2011-2020. 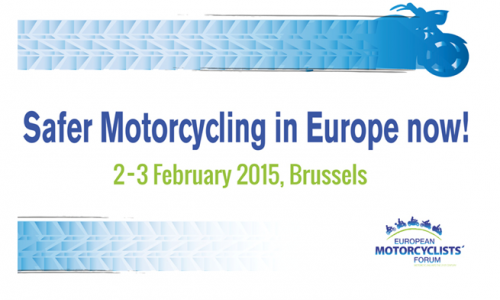 With the outcomes of the RIDERSCAN project and the publication of the OECD/ITF report on motorcycling safety (to be released by the end of 2014), we believe that the 2015 European Motorcyclists’ Forum (EMF 2015) is an excellent opportunity for all parties to discuss concrete actions to improve PTW safety in Europe. More information will come shortly, but make sure to mark your calendars already today! For more information and to follow the preparation of the event, please access our website. Closing date for registration is 19 January 2015. Seats are limited. Please do not hesitate to contact us should you have any questions regarding the event or how to register.